As policymakers weigh strategies to address the high cost of prescription drugs, the latest Kaiser Health Tracking Poll finds that a large majority of the public (72%) view pharmaceutical companies as having too much influence in Washington – more than say the same about the National Rifle Association (NRA). 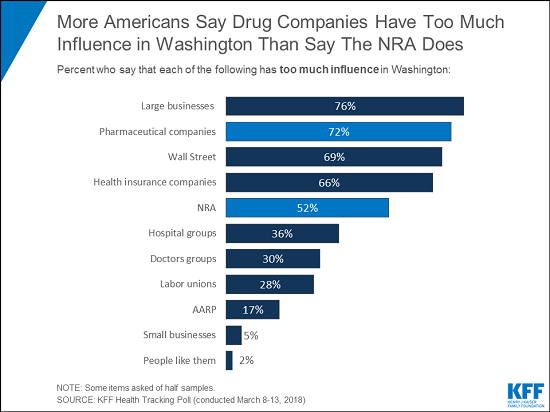 Drug makers rank among the top tier of groups that Americans say have too much influence in Washington, along with large businesses (76%), Wall Street (69%), and health insurance companies (66%). All of these organizations rank higher than the NRA (52%), which has been at the center of the debate about school safety and gun laws following recent school shootings and subsequent protests.